Publishing in a Journal? First Learn About Version Lingo! From a draft to a published journal paper, your work transforms through different versions. Understanding the terminology in this publishing process has become necessary for effective communication in the scholar community. Now, the questions: where should you put your file? And, which file? There is no easy answer. 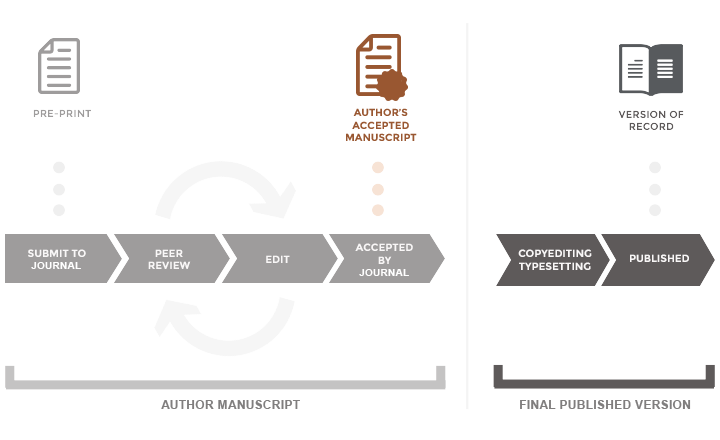 Some disciplines have popular preprint servers where authors comfortably share work in the early draft stage; some institutions or funding agents require their researchers to make their work openly accessible at certain stages in this process; many universities, such as HKUST, have repositories in place to let researchers deposit works; and certainly the policy of the publisher determines a lot what and how you share your accepted papers. This short post does not intent to give you a thorough answer to these questions; yet it intends to help you navigate the process by explaining some important terms that describe different stages of your work along the publishing pipeline. The following terms and definitions are recommended by the National Information Standards Organization (NISO)* ; although some variations of the terms are also common. Among them, AO, AM and VoR are the versions that more likely concern authors in the decision of sharing and archiving. AO is the version considered by the author to be of sufficient quality to be submitted for formal peer review. This is also known as the stage of preprints. In the scenario above, both drafts to Journal A and Journal B are considered AOs. You, being the author, have full rights to decide what to do and where to share with this version. Any version of a journal article that is under formal review managed by a publishing entity. The version of a journal article that has been accepted for publication in a journal. This stage is also known as “Author’s Manuscript” or “Author’s Accepted Manuscript” (AAM). It was also called “postprint” in the past, but this term has become used less often. AM (or AAM, both seem to be popular) should be very close in content to the final, published version, but without publisher’s enhancement such as typesetting, layout, header and page-setting. Many publishers allow authors to share AM via an open access repository while forbidding sharing of the final version (VoR). A version that includes the copy-edited manuscript, typesetting (galley proofs), page proofs, and revised proofs. It is common that publishers send this version to authors for review; and therefore it may become public, even though authors are not supposed to be so. The content has been changed from the AM; the layout is the publisher’s. A fixed version of a journal article that has been formally “published”. This includes “early release” article that is formally identified as being published even before the assignment of a volume issue, as long as it is cit-able via some permanent identifier(s). This does not include any “early release” article that has not yet been “fixed” by processes that are still to be applied, such as copy-editing, proof corrections, layout, and typesetting. Knowing the names of the different versions helps you communicate better with publishers, repositories and funders in the process of getting your work properly published and disseminated. It also helps you understand your rights to use and share your work at different stages. For example, while you can post an AO at your personal webpage, you are likely not allowed to do so with the VoR. In addition, understanding these stages can help you disambiguate different versions of the same paper that you may find in different sources. Returning to the questions of where and which version you can deposit your papers for wider access, HKUST researchers are encouraged to use our Institutional Repository. Talk with your subject librarian, or contact the Research Support Services (lbrs@ust.hk) of the Library to find out more. * Recommendations of the NISO/ALPSP JAV Technical Working Group, NISO-RP-8-2008.